Many millions of years ago the area around Calgary was part of a huge sea. During the dinosaur era, this area was warm, and hosted not only dinosaurs but generous vegetation needed to support such huge animals. Over millions of years this vegetation died and settled on the bottom of this sea. As continents shifted, Calgary became part of North America and the sediments were lifted well above sea level. The pressure of deep layers of rock on the decaying vegetation created the vast oil & gas reserves in Alberta today. The continental drift of the Pacific Plate into and under North America forced the wrinkles in the rock on the western edge of the continent that includes the Rocky Mountains. Several ice ages (the last one was only 10,000 years ago) smoothed the land to the east of the mountains and left behind the fertile western plains that today feed the world. The Indians that settled around Calgary became the Blackfoot, Blood, Peigan, Sarcee (Tsuu T’ina), and Stoney bands. These Indians used to roam the plains and the eastern Rockies, but now reside in several reserves around the city. The lands were first explored by fur traders working for the Hudson’s Bay Company and the Northwest Company (which were later to merge). The first settler and rancher in Calgary was Sam Livingston who settled in the early 1870’s after returning from the California Gold Rush of 1849. 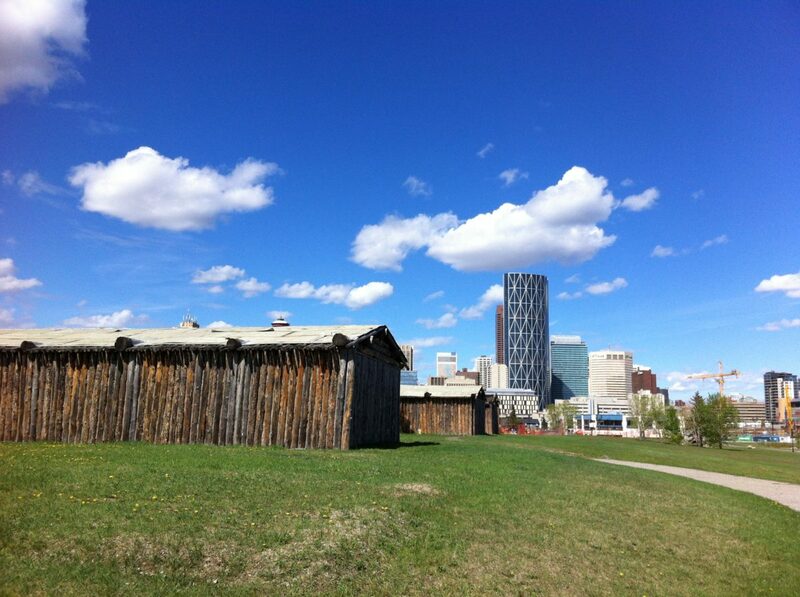 Fort Calgary was built in 1875 by the North West Mounted Police (later renamed the RCMP) to protect the western plains from American whiskey traders. The fort was originally named Fort Brisbois, after the first inspector of the NWMP. The Indians agreed to cede their land to the Canadian Government at the signing of Treaty No. 7 in 1877. The reserves are located as follows: Blackfoot near Gleichen, Blood Indians near Cardston, Peigan near Pincher Creek, Sarcee near Calgary, and the Stony near Morley. The town of Calgary was a thriving western settlement, centered around the community of Inglewood. The building of the transcontinental railroad changed the city’s landscape, as the CPR built its station beside the current Palliser Hotel. In 1896 the transcontinental railroad began carrying passengers and freight to the Pacific Ocean, and the city began to grow quickly being a jumping off point for new settlers in the area. The city became a major commercial centre as agricultural goods were sold for eastern consumption, and the farmers bought manufactured goods, brought fromthe east by the railroad. In 1894, The City of Calgary was incorporated. In 1904, the City abandoned most street names and converted to numbered streets. In 1908, Calgary got its first municipal railroad (street cars) and a public library. Many of the sandstone buildings along the eastern end of Stephen (8th) Avenue Walk and along Atlantic (9th) Avenue SE date back to this era. Over the next three years, Calgary grew by 30,000 people to to a robust 85,000. The last ice age which ended 10,000 years ago created a land bridge between Asia and North America. This enabled early Homo Sapiens to walk to this continent many years before whites came over from Europe by boat. Over the years, these natives dispersed across both North and South America. The Indians that settled around Calgary come from the Blackfoot, Blood, Peigan, Sarcee, and Stony bands. These Indians now reside in a number of reserves around the city. The first settler and rancher in Calgary was Sam Livingston who settled in the early 1870’s after returning from the California Gold Rush of 1849. Fort Calgary was built in 1875 by the NorthWest Mounted Police (now the RCMP) to protect the western plain from American whiskey traders. The fort was originally named Fort Brisbois, after the first inspector of the NWMP. The Indians agreed to cede their land the Canadian Government at the signing of Treaty No. 7 in 1877. The reserves are located as follows: Blackfoot near Gleichen, Blood Indians near Cardston, Peigan near Pincher Creek, Sarcee near Calgary, and the Stony near Morley. The Arab Oil Boycott of 1974 caused oil prices to climb steeply. While causing business disruption across most of North America, it spurred madcap exploration in Western Canada. The “oilpatch” headquartered in Calgary grew rapidly. The city’s population grew from 325,000 in 1974 to 650,000 by the early 1980s. The frenzy of downtown construction caused locals to declare the “national bird of Calgary” to be the construction crane! Any surviving building that pre-dates the 1974-1980 oil boom is these days a candidate for being declared a heritage site. The boom ended in 1981 with the “National Energy Program” (NEP) legislation created by Finance Minister Jean Chretien (now Canada’s Prime Minister), unfairly sucking over $100 billion in oil industry profits from the West. The recession the NEP caused forced Albertans to diversify their economy away from oil & gas, and is responsible for the current boom in forestry and technology sectors of the economy. The city grew in both size and business stature, with all those shiny office towers creating a virtually instant downtown. The city’s pride led it to apply for – and win- the right to host the 1988 Winter Olympic Games. The city’s mayor at the time, Ralph Klein, has since gone on to become the premier of the province of Alberta. Today, Calgary’s population is over 1,100,000 (2009), with slow and steady growth. The 1996-1998 gas exploration boom, offsetting a relatively weak Eastern Canadian and B.C. economy, has led to a large influx of new residents into the city. The city has grown by an average of 20,000 people per year over the past several years. In 1940, the Icefields Parkway opens to connect Banff and Jasper, though a large forest fire near Saskatchewan Crossing forced the highway to be closed for a while. in 1952, commercial snowmobile rides begin on the Columbia Glacier. In 1956, The Trans-Canada Highway is completed through to Yoho, making travel by road from other parts of Canada a little less of an adventure. In 1970, The Yellowhead Highway officially opens, connecting Edmonton, Jasper and points west. In 1977, the Alberta Government establishes Kananaskis Country, east of Banff National Park. In 1980, the Sunshine Village gondola begins winter operation, saving skiers a cat ride up the mountain. In 1985, the National Parks celebrate their Centennial and Banff National Park becomes a World Heritage Site. Banff’s Cave & Basin Hot Springs reopens after 10 years of renovations. Calgary hosted the Winter Olympic Games in 1988, with Nakiska on Mount Allan (in Kananaskis Country) the site for downhill skiing. Canmore hosts the nordic skiing events at the Canmore Nordic Centre. This event drew world attention to the scenery in the Canadian Rockies. In 1989, a new visitor centre opens in Field and a new wing is completed for Chateau Lake Louise. The next year Banff becomes a self-governing community and regular passenger train service through the Rockies is discontinued (re-established a few years later, but only between Calgary and Calgary). Over the next few years, 1994 the Mount Norquay Ski Area is expanded and Sunshine Village adds the Goats Eye chairlift. Because of growth restrictions placed on Banff inside the national parks, Canmore begins to see a tourism boom. In 1996, the Three Sisters development begins in Canmore. To the west, significant development also happens in the BC communities of Radium, Golden and Revelstoke.